While we all love listening to music while we are working and playing, there have always been opposing scientific views of whether music makes us more productive or more distracted. Recent studies have shown that silence is more distracting to almost every profession, while music (provided it’s the right kind) can make a worker more alert, responsive and on task. We’re not talking about listening to an award-winning Drum-Off or anything, but music ranging from classical to rock-and-roll has been shown to increase productivity and enhance performance. Music has become more and more acceptable in the workplace as 58% of managers believe that denying their employees music in the workplace would be damaging to their performance, and 88% agree it makes the work environment better. But what’s there in terms of scientific research? Several studies have shown that having music in surgery is beneficial to both surgeons and staff, including research conducted by the University of Texas and research published in the British Medical Journal. Music is played 62-72% of the time in the operating theatre and, according to the Guardian, the playlist is chosen by the chief surgeon. While classical music is their primary choice, a surprising number of doctors enjoy rock, country or hip hop music as well. Everything from Taylor Swift to Michael Jackson to Enya has been played in the surgery theatre, often depending upon the complexity of the surgery. According to a piece from Huffington Post, music choices can calm the staff and relieve stress , and 80% of operating room personnel agree that music benefits the entire team. Some songs can speed up the stitching process and also allow the surgeon to slow down and focus. It also seems that music may benefit the patients themselves. A 2009 study found that playing relaxing melodies for patients reduced their anxiety far more than pharmaceuticals. Further studies are being done to record the effects of live music therapy on patients with persistent pain. Engaging with music allows patients to connect with the healthy parts of their body and overcome their focus on their pain. Athletes, gamblers and gamers alike have also embraced music as a way to focus their skills and hone their strategies. Dr. Costas Karageorghis has authored hundreds of studies on how music can affect the performances of athletes. Music draws your attention away from fatigue and can improve endurance by 15%. Just ask tennis star Victoria Azarenka or even her colleague Serena Williams, who arrive on court with music playing on their earbuds. While some might find this disrespectful to audience members, it helps these athletes focus before a game or match. Athletes like pro skateboarder Tony Hawk and Denver quarterback Peyton Manning have gone so far as to publish their music playlists to inspire others. Professional poker players are no different in their desire to focus before and during a demanding game. Some take time before a game to focus their energy with specific music and others wear headphones during the tournament. A number of pros belonging to Team PokerStars recently published their personal Spotify playlists of what they listen to while sat at the green felt, to inspire and motivate themselves. Hockey star turned poker player Fatima Moreira de Melo enjoys listening to R.E.M and Red Hot Chili Peppers while high stakes player Jorge Limon prefers classical and ambient music to get him to the relaxed state he needs to win. Rock and Roll Hall of Famers seem guaranteed to be on a pros list. It’s common sense that music is very helpful when performing repetitive activities. Studies have shown that music improves performance in the catering industry, but also office and factory workplaces. Listening to music puts people in a good mood, making them faster and more productive at routine activities. 90% of mid-range salary office workers believe that listening to music makes them enjoy their jobs more, no matter the task at hand. In fact, as far back as the industrial age, musical groups or singers would be brought in to play music among the workers. After radio was made popular, BBC radio launched a program called “Music While You Work,” back in 1940. Increased productivity, increased alertness, fewer accidents and better team management were the results. It is important to choose music for the specific workplace and the results you want. High-energy music at the end of a restaurant shift will make clean up and closing go faster and more effectively. 74% of office and factory owners/managers believe music improves morale, therefore improving performance. A surprising arena for music and productivity is that of the student and the writer. One would normally thing a rapturous beat and disarming lyrics would distract the wordsmith from her tale or make the students’ minds wander to more interesting things than chemistry or calculus. Writers spend the majority of their time in front of a computer screen, which can get inordinately boring. Studies have shown that certain types of music can help boost the thinking and creative process. While the soundtrack to Star Wars can rev up certain creative juices, both classical and electronic music have been observed to improve story production for the obvious reason that they do not contain lyrics. There are even studies that claim that a certain bpm level can stimulate different creative realms – if you’re wondering, it’s actually 60 beats per minute. How about for students studying for exams? The jury is out. In the 1990s, researchers coined the term “the Mozart Effect,” proving that music had the ability to focus the memory, improve attention and relieve pre-exam anxiety. Of course, most students do not listen to Mozart these days, so it’s hard to say if Lady Gaga or Metallica really focus the mind. All in all, music soothes the soul, peps up the pace and relieves everyday boredom, making work a more enjoyable place to be. 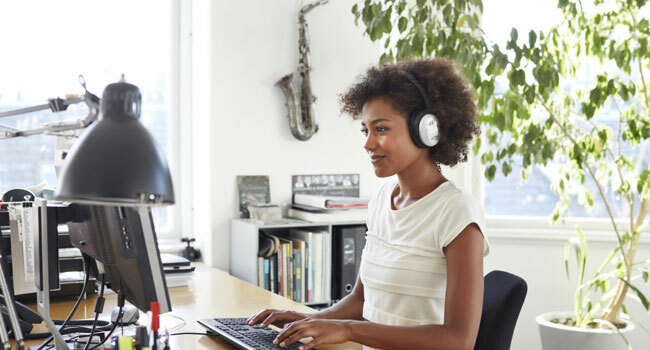 The amount of research that has been devoted to this area is impressive and the overall verdict is out – music can indeed boost your productivity, so let your manager know next time you’re asked to turn off your tunes.